The growth of childhood obesity in the United States is staggering. We have now reached a point where 1 out of 3 kids are overweight or obese. I knew of some weight loss apps for adults, but, like Weight Watchers and Jenny Craig, they were all either unsafe or ineffective for children. Then I discovered the nationally recognized Stanford Pediatric Weight Control Program at Lucile Packard Children’s Hospital, where I finally found the effective tools and practical guidance I was looking for. University based weight loss programs for kids are highly effective for local families – but what about children and families that do not live near a University based program? How can they receive help, guidance and support to control and manage their weight? I wanted to find a way for the program’s proven weight management tools to reach more kids. Recognizing this gap in the marketplace, I came up with a plan: to adapt Stanford’s program to a scalable, mobile platform for kids and teens. Thus, the idea for Kurbo was born. To carry out my plan, I needed an expert in the field of pediatric weight control, so I teamed up with Thea Runyan. Thea is the Lead Behavior Coach for the Stanford program and for over 12 years, has successfully helped over 600 families manage weight and lead healthier lifestyles. With her experience and dedication to taming the childhood obesity epidemic, Thea connected to my vision and recognized its potential to positively change the lives of kids, teens and their families. With the help of $5.8 million in venture capital funding, we launched Kurbo Health. 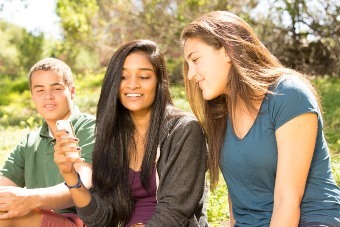 Kurbo Health licensed the program from Stanford University’s acclaimed pediatric weight control program and incorporated the programs’ tools and principles into a fun, engaging mobile app and weekly live-coaching sessions. It’s the first safe, effective and accessible mobile weight management program for kids, teens and their families. The Kurbo Program teaches kids how to change their eating and exercise habits in order to reach and maintain a healthy weight. It is not about dieting, calorie counting or deprivation. These imply short-term results, create a negative stigma and hyper-focus around food and only magnify the issue at hand. Instead, Kurbo is about gradually gaining control of your health by making healthy lifestyle choices. Kids start seeing real signs of success after 3 to 4 weeks of the Kurbo Program. A critical component of the Kurbo Program is the free, easy-to-use mobile app. Kids use the app to track their food and exercise using a version of the research-based Traffic Light system. Here’s how the system works: green light foods include fruits and veggies, yellow light foods include grains, lean protein and low fat dairy and red light foods are high in unhealthy fats, sugars and high calorie density foods. Once kids start tracking their red, yellow and green light foods, they become aware of their eating habits and start making healthier choices. The goal is to eat a well-balanced diet by increasing green light foods, moderating yellow light foods and minimizing red light foods over time. This is a safe way for kids to eat healthier and manage their weight. The app also includes videos and games that introduce concepts like food classification and portion size and provides instant feedback, reminders and rewards to keep users on track. Kurbo also encourages challenges, like having a red-free day or trying a totally new green light food, that keep kids engaged and motivated to achieve their goals. The Kurbo Program provides weekly supportive coaching sessions with a trained Kurbo coach. These sessions can either be via text or email. Each week, your child’s Kurbo coach evaluates their progress by reviewing food and exercise choices, making actionable suggestions and working with your child to set reasonable goals for the next week. Coaches also teach your child how to plan ahead and budget their number of red light foods for the week. Say, for example, your family is going to a birthday party on a Friday. Your child’s Kurbo coach will help him or her use the app to rebudget reds, adding more reds on Friday (and fewer on other days of the week) to make sure he can eat pizza and cake and still meet his red-light goal for the week! Not only is the Kurbo Program fun and affordable, it works. Kurbo’s beta test results showed that 88% of kids (ages 8 to 18) who met with Kurbo coaches for 10 weeks reduced their BMI (body mass index), lost an average of 5-10 pounds, exercised more frequently and felt healthier, happier and more confident. While Kurbo kids gain tools to lead healthier lives, Kurbo parents get to take a break from being the “food police.” Kurbo reduces the tension and conflict around food and exercise that many parents face with their children. Coaches become a source of support, motivation and accountability. However, parents are still encouraged to be actively involved in their child’s Kurbo journey. Parents can participate in coaching sessions, receive a weekly email newsletter and have access to parent-focused experts who can answer their specific questions and concerns. Kurbo invites the whole family to use the Kurbo app, because kids are more successful when their families are tracking along with them. In fact, many parents lose weight too. I created Kurbo Health as a solution for families, kids and teens who are struggling to lose weight. What started as a mission to help my son, has become a mission to help millions of kids and teens live healthier, lose weight, adopt better eating habits and feel really good about themselves. Do 60 minutes of physical activity every day. Incorporate exercise in a family routine like walking after dinner. Limit Red light Foods like candy, chips, and crackers by buying less! Don’t drink your calories! Avoid sugary drinks like soda, sports drink and juice. Eat breakfast, lunch and dinner everyday. Don’t skip meals! Don’t make the scale scary, it’s just a tool: It is important that parents don’t transfer their fears about the scale to their kids. At Kurbo weight measurement is simply another tool to assess progress, just like food and exercise tracking. Encourage kids and teens to weigh themselves NO MORE than once a week: Research shows that weighting yourself regularly (not obsessively) is very important for managing a healthy lifestyle. Success is not measured in pounds: At Kurbo, a child’s success is not defined by weight loss but instead, by learning and maintaining healthy behaviors and making smart choices about food and exercise. Kurbo is an amazing program, that really transforms lives. I can say firsthand that it works, and is better than any other program that exists for children and teen who want to lose weight. The program is simply, but effective, with kids making gradual small changes that lead to great results. 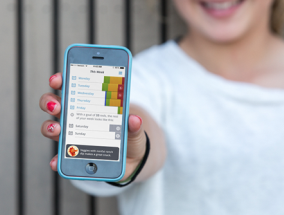 The app is full of educational videos, games, and a tracker that lets kids get a better sense of what they’re eating. The coaches are worth every penny and vital to the kids success. If you want your child or teen to lose weight, signing up for Kurbo is a no brainer. Sign up for the coaching, because it is absolutely worth it!